I grew up fishing Casco Bay and have been honing my fishing skills for years on the ledges, in the salt marshes, and on the flats of southern Maine. Although striped bass on the fly are my primary quarry, there's something to be said about the impressive fight pollock and mackerel will put up on a 5 weight. Depending on the tide and how you want to fish, we will fish from my Aquasport 200 Sarah Jeanne among the islands and ledges of Casco Bay, wading on the beaches or ledges of Saco Bay, or from a canoe in one of the many salt marshes in the area. Boat fishing: Fishing the beautiful, rocky coast of Casco Bay is a truly Maine experience that no one should miss. New for 2017 Anadromous Adventures is pleased to offer inshore fishing trips on our 20' Aqauasport. Equipped with a 115hp Yamaha, this is a safe and proven design, an ideal inshore fishing boat. With a slight vee and shallow draft, this boat is just as comfortable for fishing breaking waves on the ledges as it is stalking individual fish on the flats and in the marshes. The large forward casting deck and livewell under the center console makes this boat a fishing machine, perfectly suited for fly fishing, light tackle, and live lining mackerel. In addition to fishing for stripers and the occasional bluefish, this boat also makes a great platform getting novice fishermen and kids hooked up quickly--jigging for mackerel! Pick up for boat trips will be in Portland, Falmouth, or any of the Casco Bay islands. I provide all gear on the boat, but if you are inclined to bring your own I recommend for fly fishing a 9' 9wt with at least one sinking tip and one intermediate line. We occasionally fish floating lines. Flies recommendations are clouser minnows, flatwings, and grocery deceivers (mackerel and pollock). A stripping basket makes line control easier, but is not required on the boat. We will provide water and snacks. Feel free to bring a few beers or wine, but liquor and illegal drugs are strictly prohibited. What to bring regardless of fishing method: sunglasses, sunscreen, hat, non-marking shoes, snacks, drinks. If you are prone to seasickness, don't forget your medication of choice. Adam with a gorgeous bass taken in Casco Bay. Our Aquasport 200 is the perfect size to get us to the fish both safely and efficiently. Sarah looking for some early season fish on the Aquasport in Hussey Sound. This very healthy fish was fooled with a clouser on the flats. Morning time is the right time! Shore fishing: Fishing for stripers on the flats of Saco Bay and Casco Bay is an experience in Maine that will test any fisherman. Truly, sight fishing for spooky bass at first light while wet wading might be the perfect summer morning. You'll be amazed at how close to the beach we find feeding stripers, especially in the early season (late May-late June). We also fish from ledges with both fly and spinning gear. Potential shore fishing locations include Cape Elizabeth, Scarborough, Saco, Biddeford, or Long Island. All fly and spinning gear is available, but if you are inclined to bring your own I recommend for fly fishing a 9' 9wt with at least one sinking and one intermediate line. We occasionally fish floating lines with poppers--if we are lucky! Flies recommendations are crabs, sandlance immitations, clouser minnows, flatwings, and grocery deceivers (mackerel and pollock). Yo-zuri crystal minnows, soft plastics, and pencil poppers are commonly used with spinning gear. We will provide water and snacks. Feel free to bring a few beers or wine, but liquor and illegal drugs are strictly prohibited. What to bring: waders, lug or studded wading boots, stripping basket (fly only--we have extras but please feel free to bring your own), sunglasses, sunscreen, hat, snacks, drinks. Perfect sized striper for fly tackle on the beach. Fishing here kicks off in mid-May and is pretty consistent until the summer doldrums, when we switch tactics and fish very early morning and late nights primarily. However, this is my other favorite tactic really shines--ledge fishing from the boat is consistent throughout the day, and the big fish just can't resist a live mackerel suspended in whitewater. Trips can combine multiple tactics including fly, light tackle spinning gear, and live bait depending on your interest. By September, the the fall run begins and fish are looking to pack on as many calories as they can before migrating south again. Let's figure out what kind of day works best for you. As a marine biologist, I am an avid participant (both as a fisherman and scientist) in the Snap-a-Striper Program run by the Gulf of Maine Research Institute with help by CCA-Maine. Snap-a-Striper is a data collection program aimed at 1) compiling photos of live released striped bass and 2) saving the heads of legally harvested keepers. We can use this data to help determine stock of origin of fish caught in Maine, thereby helping to appropriately management of this iconic species. A schoolie striper harvested, with data card in photo for scientific analysis. Anadromous Adventures guide and owner, Zach, with an early season schoolie from the beach. Charlie and Walker out among the islands of Casco Bay on a perfect summer day. Sunrise on the coast of Maine. I spend the winter tying flies to make sure we have exactly what we need all summer. 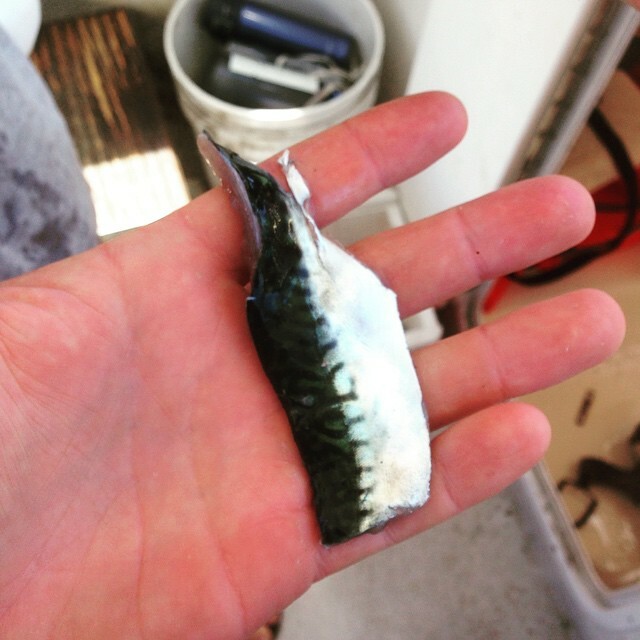 Fresh mackerel is hard to beat... we always keep a bottle of soy sauce handy when fishing saltwater.